“Kikola – The Timekeeper”, an exploration of the rhythms, human life, animal life and nature. This experimental short movie shows the resemblances and organic metamorphoses of all forms of life.Experimental Documentary – “Kikolā – the Timekeeper”, 2K, 18 minutes, ISBN: 978-0-9801378-8-0. Los Angeles: Cactusfield Productions, 2013. Luis Proenca directs documentaries and new media art. Bali – Arts and Creation is Proenca’s most recent work in which he served as Producer, Director and Editor. Pukiki – The Portuguese Americans of Hawaii was internationally broadcast over five continents on RTPi (Rádio Televisão Portuguesa Internacional) and was an Official Selection of the Hawaiian International Film Festival (October 2003). His documentary, Touchstone – The Rock Art of Côa Valley concerns rare forms of art produced 20,000 years ago and it has been distributed in Europe. Luis has directed live television programs for Portuguese National Television. He broadcasted at RTPi (Rádio Televisão Portuguesa Internacional) two documentaries about the Portuguese community in California called Tradition and Off the Boat. He is also in pre-production of a documentary about the Missions in California. 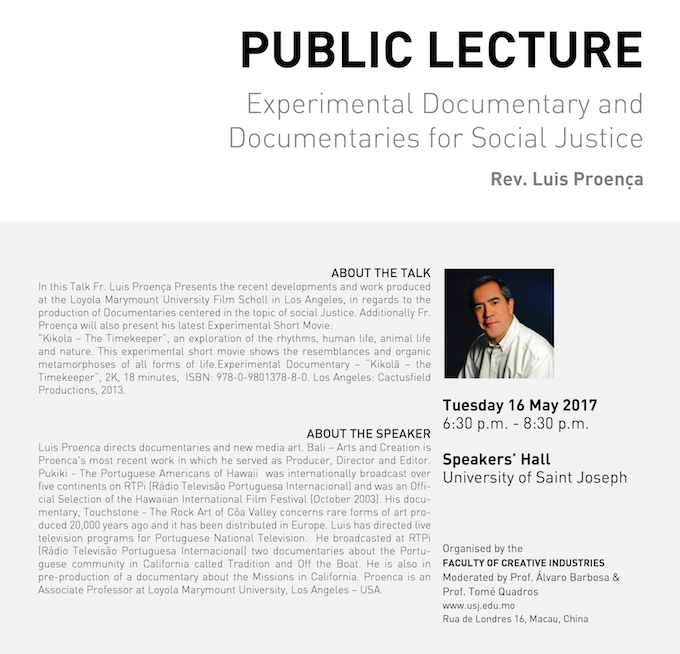 Proenca is an Associate Professor at Loyola Marymount University, Los Angeles – USA.